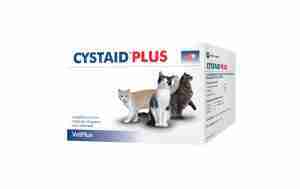 Feline Cystaid Plus Capsules are a nutritional supplement for the management of lower urinary tract function in cats to help maintain a healthy bladder. The signs of a bladder inflammation can include blood in the urine, urinating more frequently or showing signs of pain and difficulty urinating. A health indicating cat litter will also help you detecting the first symptoms. If you spot one of these symptoms or the litter indicates in issue, please seek advice from for vet. If left untreated, deterioration of the bladder wall could cause your cat more discomfort. The package contains 240 capsules. Cystaid can be given whole or sprinkled and mixed with the food. These capsules have done wonders for my 2 elderly cats' stress-related cystitis. One cat hasn't had any symptoms for 18 months and the other gets less frequent and milder attacks that don't usually need a trip to the vet - much to her relief! Highly recommended.